We made the first batch of eggnog last week after the sun set, which in winter is such a dramatic drawing of the curtains. Because it’s actually 4:50 pm! 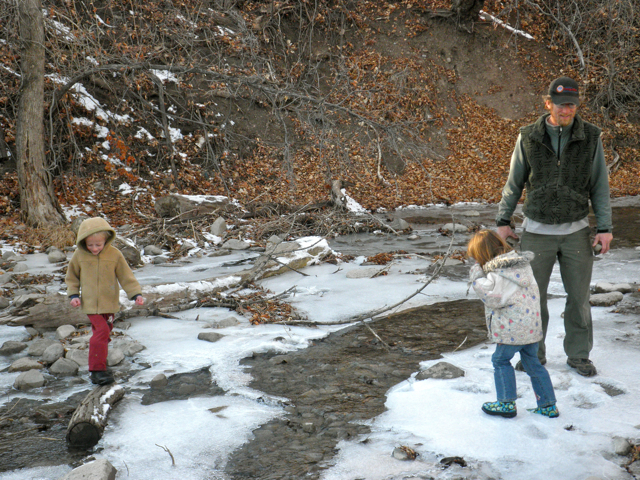 Which is the precise time in July that we’re headed to the river, bedtime still lightyears away and nothing more pressing on the agenda than dipping hot limbs in freezy water. And really, I love that we’re not traipsing through the easy meadow of summer all year long like a romance film on endless repeat. Not that summer’s isn’t a bouquet of joy and beauty and specialness, daily. Oh, it is. 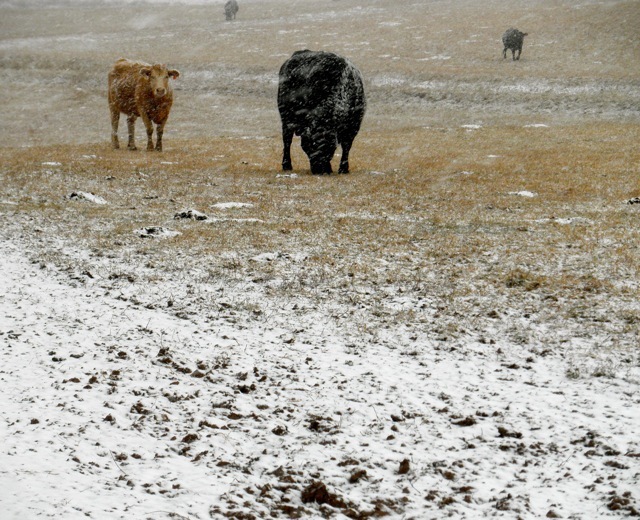 But I like how winter draws us close and holds us there, if even a bit too long or forcefully. It’s in this being pressed together—our family like wildflowers in a heavy book—that I remember the quieter joys of an inside life. Which is to say, we’ve been making a lot of eggnog. And I think you should make a batch for yourself too. Because it’s festive and delicious and the sort of thing that tastes best in the last days of December when daylight is a thin sliver between two slabs of darkness. If you mix a batch after the kids are in bed, you may feel a little giddily deviant, giggling over sweet boozy cream like you’re sneaking it behind their backs. 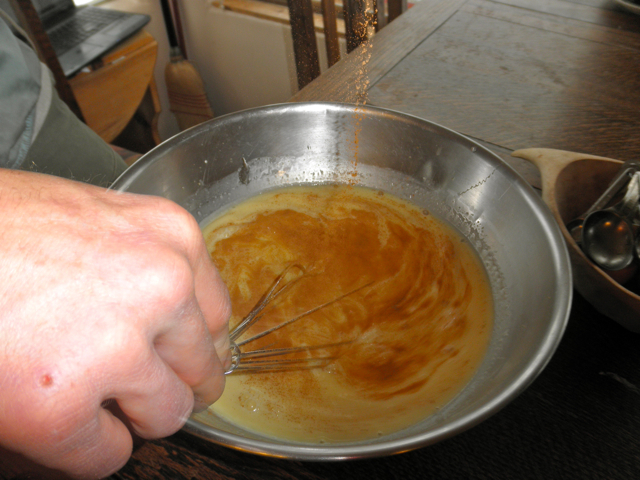 First, whisk the eggs and the sugar for 5 minutes (I made a batch with honey recently, which is fine, but make sure your honey is room temperature and add it to the eggs before you add the cream, which is cold enough to crystallize the honey). 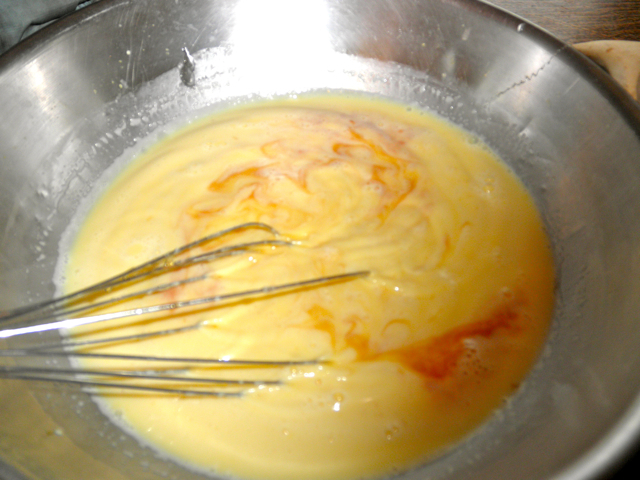 Next, add the milk and whisk a few more minutes. Next add vanilla and pumpkin pie spice. 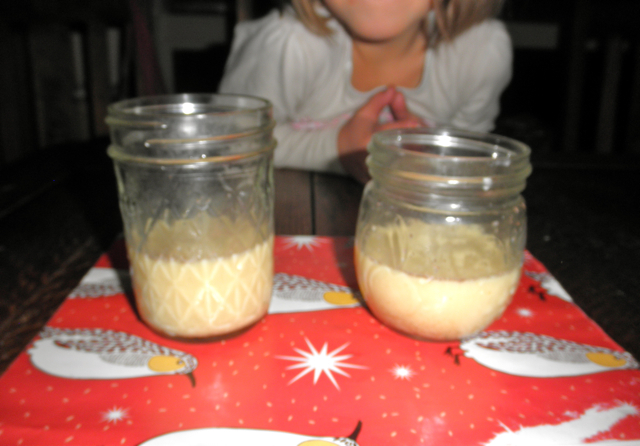 If you’re nice, now’s the time to pour off some non-alcoholic eggnog for the kids to lap up in the morning. Add rum to the rest, mix well and chill in fridge. Also, lovely in coffee. Loved reading this! Thank you RAchel! I’m going to try this on Christmas. My mom always made homemade eggnog during the holidays. Why I haven’t tried it yet I do not know! And the Wish I’d Said That Award goes to Rachel for “…the last days of December when daylight is a thin sliver between two slabs of darkness”. So yummy. For those who don’t have access to farm raised eggs or simply don’t feel comfortable eating raw eggs, no matter the source, Cooks Illustrated has a recipe that cooks the eggs and milk together until it reaches 160 degrees and makes a thickened custard. You need a thermometer for this. 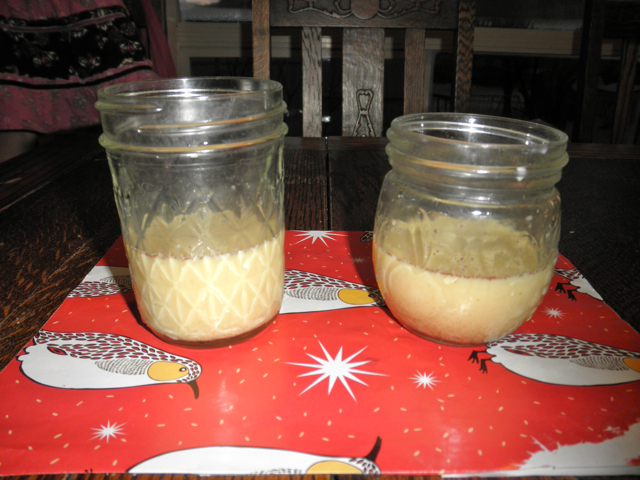 If you over cook it you end up with egg pudding (which, if your family is like mine, will not go to waste). The cooking also thickens the mixture somewhat, allowing you to cut back on some of the cream, using whole milk instead. Cheers. I like mine with a splash of rum. 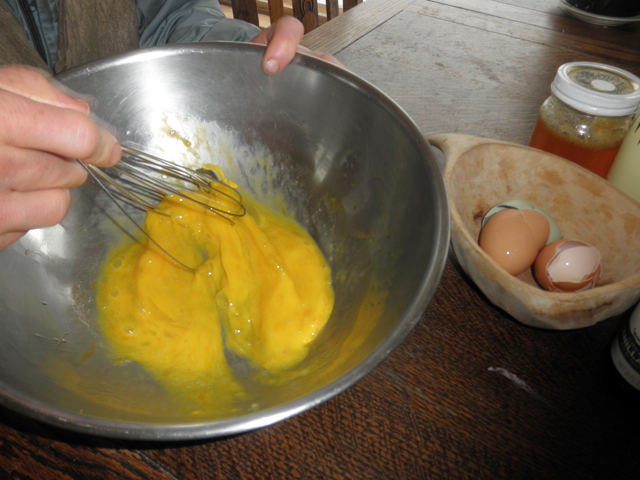 mmmmmm….thickened eggnogy custard. Sounds like the next frontier for my obsession. yay for fats! and rum! and backyard-fresh eggs!! YUM. this will be fun when we visit my folks…thank you! Christy, now is a great time to glean garden inspiration. I love “Gaia’s Garden” (can’t remember author), it’s a permaculture guide and is practical and beautiful. Although I don’t do Square Foot gardening, the book, “Square Foot Garden,” is really helpful and informative and I’ve learned a lot from him. And for the most beautiful words on farming, Gardening at the Dragon’s Gate written by the head gardener at Green Gulch Zen Center makes you want to devote your life to soil. I love your stories, and recipes. The “ocean of raw orangeness” recalls to me my southern grandmother’s eggnog recipe (with a dozen eggs! 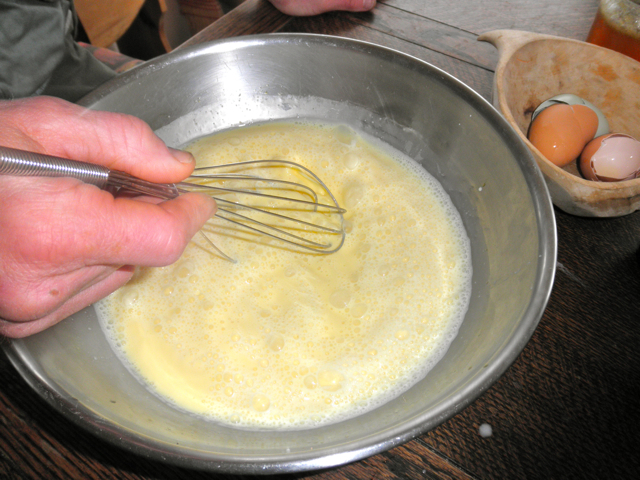 ), which took the step of separating the eggs in order to “cook” the yolks in the booze (bourbon, I believe) and then whip the whites for extra frothiness. My father would make this concoction every New Year’s eve, and we would all have some, even the kids, on the only night we were permitted to taste anything with alcohol. I don’t, honestly, remember liking it, but I loved that I could have it, and the thick frothy drink, topped with that grated nutmeg sprinkle, remains one of my childhood sense memories. Kara, I did read that some people believe the booze can cook out any hints of salmonella. I’m just going to go with that. Because I’m very trusting. Also, we opted not to separate the eggs because of the extra trouble, but I am kind of curious about the frothiness factor of the egg whites. Next batch, maybe… Good to hear from you Kara, love to your family, especially college-bound Claire! Ooh, I’ve never dared making homemade eggnog (mostly because I’d have to drink the whole batch myself, as no one else liked it, though M converted last year–and also because it seemed like a lot of work), but perhaps I’ll give this a try for New Years (cannot possibly add one more thing to my list before the holidays, not even one boozy thing). Can I just come over to your house? Ha! The quiet times occur between 6:30 pm and 5:30 am, before the day starts all over again. Those 11 hours are divine. Oops… forget to say what a rare writing talent you have. You weave words with such mastery. Thanks for sharing! mmmmm in coffee… makes me wish my migraines hadn’t gone away when i stopped drinking coffee. but they did. so i am not. but it still sounds divine! ouch puncture wound! i should make quinn some nog, he would love it. he always wants to eat raw eggs when we’re baking. sending the kids to marcy’s and making this for date night! hello dear lady, i am so making this, only thing better for me would be raw milk…maybe next year. and in coffee? word. Mmmm! I love eggnog. It’s also great if you separate the eggs and whip the whites to fluffiness before mixing it all together, makes the nog light and frothy. I’m trying to like eggnog again this year. Not sure I’m up for making it myself, but I found a version at the store this year that doesn’t have corn syrup, so that’s a start. I hear you about the early darkness – here the sun has been setting before 4:30 for a couple of weeks, and with the frequently grey skies, it’s pretty gloomy at times. Sometimes it’s almost dar at 3:30 or 4:00. This year seems to be affecting me more than usual. We’ve been enjoying more candles and tea and knitting. It does seem to keep us indoors more than usual. We’re looking forward to the return of the light. Awesome! 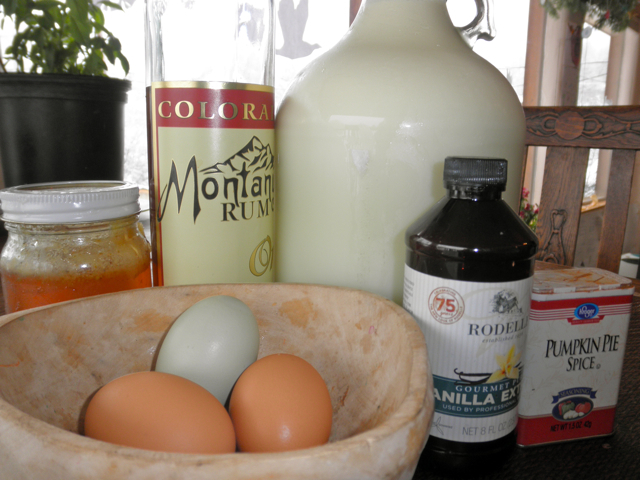 I’ve been searching for a homemade egg nog recipe and this one is perfect! I found you post from the Homestead Revival Barn Hop! Eggnog is my favorite part of the holidays! This would be a great post to share at our Meal Plan Monday link-up at http://www.modernalternativekitchen.com! Hope to see you there tomorrow! Thank you for sharing at Meal Plan Monday! Hope to see your latest post at tomorrow’s link-up!